ALL THE TIMBER WE USE IS PRESSURE TREATED. DON'T CONFUSE OURS WITH INFERIOR NON PRESSURE TREATED VARIETIES. PRESSURE TREATED FOR 10 + YEARS PROTECTION FROM ROT & INSECT ATTACK! Our Picnic Tables are made from thick quality 89 x 38 mm (4"x 2") tanelised timber. The wood is pressure treated to withstand years of British Weather. Our tables feature 7 full slats on the table and 3 full size slats on the seating, beware of lesser grade picnic tables available that aren't up to these standards! A parasol hole is drilled in the table center. Quality picnic tables made in the UK by hand. Being of a commercial quality our benches are suitable for gardens, pubs, restaurants, schools, playgrounds etc. We have even supplied them to local councils. Our picnic tables can be supplied in natural colour (this appears a greenish tint due to the pressure treating) or a rustic, mid brown stain. Both finishes are ready for use, we recommend the natural finish if you prefer to use your own colour. All exposed fixings are rust resistant and are supplied with a black plastic cap to avoid snagging on clothing or scratching if accidentally caught, this is a must for commercial premises. Length 180 cm 72" Table top width 69 cm 27.1" Seat width 29 cm 11.4" Overall width 150 cm 59" Seat height 45 cm 17.7" Table height 72 cm 28.3". 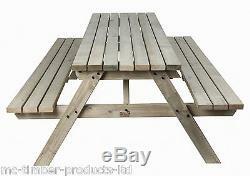 (Please call for details) The picnic table comes partly assembled in 3 packages. Easy to assemble and supplied with all fixings, all you will need to assemble is a 10 mmner or ratchet or power driver. 6ft Wooden Timber Picnic Table Bench Heavy Duty £10 OFF" is in sale since Wednesday, September 2, 2015. This item is in the category "Garden & Patio\Garden & Patio Furniture\Garden & Patio Tables".